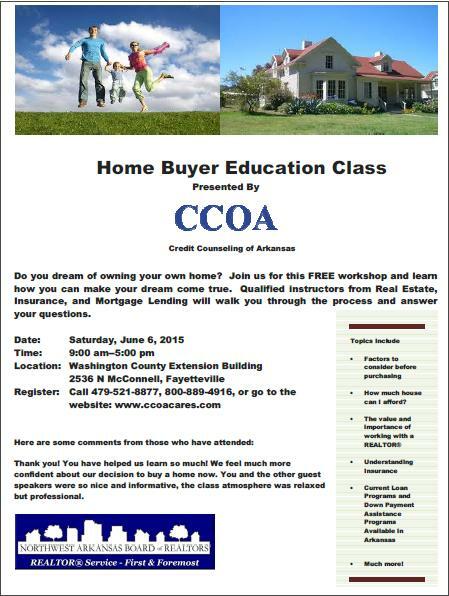 For people who are purchasing their first home, I highly recommend they attend a free new homebuyer class. Purchasing a home is the largest transaction that most people make in their lives. If you’ve never been through the process, there are a lot of moving parts that you might not realize. 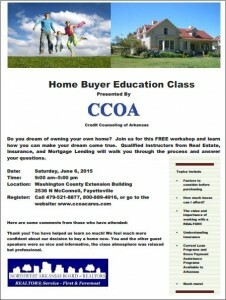 Credit Counseling of Arkansas offers a free new homebuyer class each month. The next one is 9 am – 5 pm on June 6 at the Washington County Extension Building. Qualified instructors from the real estate, insurance and mortgage and lending fields will walk you through the process and answer your questions. Topics covered during the new homebuyer class include factors to consider before purchasing, home much home you can afford, the value of working with a realtor, current loan programs and down payment assistance and more. Download the flier for more information. No reservation is required for the course.